﻿ Gabion - Woven Wire Mesh - Anping County Zhuoda Hardware Mesh Co., Ltd.
Gabion, a double-twisted wire mesh container of variable sizes, uniformly partitioned into internal cells, interconnected with other similar units, and filled with stone at the project site to form flexible, permeable, monolithic structures such as retaining walls, sea wall, channel linings, revetments, and weirs for erosion control projects. 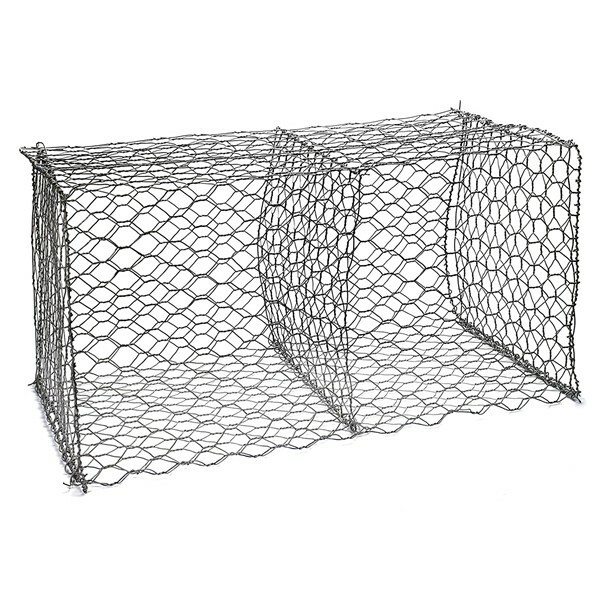 Gabion mattress, a double-twisted wire mesh container uniformly partitioned into internal cells with relatively small height in relation to other dimensions, having smaller mesh openings than the mesh used for gabions; gabion mattresses are generally used for riverbank protection and channel linings. Double-twisted wire mesh, n—a nonraveling mesh made by twisting continuous pairs of wires through three one-half turns (commonly called double-twisted) to form hexagonal-shaped openings which are then interconnected to adjacent wires to form hexagonal openings. Style 1 double-twisted mesh shall be manufactured from zinc-coated steel wire conforming to Specification A641/A641M, Class 3 coating, soft temper. Style 2 double-twisted mesh shall be manufactured from Zn-5A1-MM-coated steel wire conforming to Specification A856/A856M, Class 3 coating, soft temper. Style 3 double-twised mesh shall be manufactured from the same type of metallic-coated steel wire as Style 1 with an additional PVC coating extruded onto the metallic-coated steel wire.